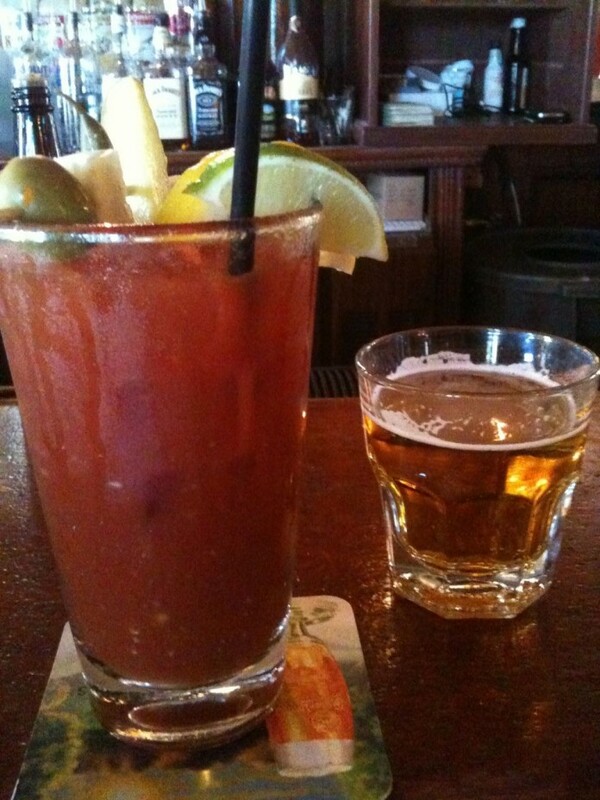 Looking for the best Bloody Mary in Mequon? TMN’s two biggest Bloody addicts ventured out on a Sunday morning to do some serious bloody research at some of Mequon’s top cocktailing establishments. Our first stop was at the Historic Centennial, which has been home to various outfits since 1895, including a brothel and a speakeasy. On this fine Sunday, we watched our oddly serious bartender with a bloody Aussie accent shake up a traditional Bloody Mary with surgical accuracy – carefully spooning out the horseradish, pouring the pickle juice, and dashing the Worchestershire, celery salt and Tabasco. No pre-mixed, processed, half-assed refreshment here! The garnish of pickle, olive, dilly bean & pepper jack cheese cube was substantial, but didn’t outshine the rich, robust Bloody. This was no nouveau-gourmet concoction designed to challenge the buds or push the bloody limits; it was simply perfectly executed and fully enjoyable. This bold kick-in-the pants wake-me-up was served with a requested Pils Urquell chaser that remained untouched until the end. The good. Centennial made the best damn Bloody Mary I’ve had in years (and I’ve had plenty) – and our unanimous choice of the best of the Mequon Bloodies. The bad. It’s always a fine finish to eat the garnish after it’s been stewing in the flavors of the Bloody. It was my bad forgetting to soak my garnish; I kept it perched atop the glass. The ugly. Nothing ugly about this Bloody, so I’ll just take their sorry flatware to task. The fork and knife accompanying my omelet were made of a cheap, dull bent metal that zinged my last mercury filling. Our second visit was to Libby Montanas and it appears Neidermeyer’s focus is more on the big family brunch, the volleyball and TV sports than on the Bloody Mary mix. Our first sips brought to mind a cold tureen of tomato soup with a few careless shakes of Tabasco. While the bartender was a friendly bloke who chatted passionately about Apple products, the Bloody was a bit hard to swallow and too sweet for our taste. The garnish did nothing to improve the uninspired mix. Our Michelob chasers disappeared well before our Bloodies reached the halfway mark. As people dribbled into the bar for the early slate of NFL games, we poured out. In contrast to Libby Montanas, Taylor & Dunn’s Public House held a lively, rowdy game crowd, one seemingly more suited to Germantown or Stepney than Mequon. We found the only two stools remaining at the bar and the questionable view was of… well, ourselves, reflected in the enormous mirrored beer tap tower. We shouted our Bloody order to the busy barmaid when we glimpsed her hands under the tappers. As we surveyed the booming surroundings, a woman at the end of the bar waved to us and pointed to a red blotch at the corner of her lip, mouthing the word “shaving.” Mercifully, we remained dumbfounded for only a few beats, as our drinks arrived shortly thereafter. This round was another disappointment – again, a sweet Bloody that had even less character than the crowd. Unfortunately, our refreshments were indistinct, unappetizing, uninspired and remained unfinished. Just as hands plunked a tiny chaser believed to be a Miller Lite from under the tap, the vegetarian among us noticed the assumptive sausage poking out from her beverage, much to the chagrin of her digestive system. The games were well under way by our final stop at the Highland House and we were immediately impressed by the appealing selection of venues. We snatched up an obviously overlooked outside table, sitting fireside al fresco in front of a big flat-screened TV for the Packer game. Perfect for an Indian Summer Sunday. HH serves the most festive Bloodies. There was drama followed by a half moment of horror as we gazed on a mount of stretched cheese curds sprawling out of an oversized tumbler – and our vegetarian half noticed more sausage! What was worse, especially for the meat lover’s among us, was that the beverage was laden a mother lode of dry spices, which fills your mouth with unsifted twigs and bits you almost need to chew. Now we have nothing against oregano, but it appears someone loosened the cap on the ol’ spice bottle. By now, we were Bloodied out, but still had no trouble finishing off the little Coronita chasers. Highland House was a wonderful spot to chill, but we would by far recommend their Mequon Margaritas over their chewy Bloodies. The good. The Bloody presentation deserves an A. The atmosphere and overall vibe score A+. The bad. The Bloody Mary is much too akin to the salsa on the table. The ugly. The floating particles in the Bloody itself. And of course, the meat garnish. Previous articleBiggest Snowstorm of the Year to Hit Mequon!! !